Now that I’ve completed work on the outside body of the coat, I can now turn my attentions to the inside and the lining. For the bulk of things this is a fairly straight forward affair, with many of the pattern pieces from the outside doubling up for the lining too (see left). The back panels and under arm area is soon together, leaving me to make and sort out the inside front panels. The inside front and lapel are the only significant difference from the outside. I traced the front panel incorporating a style line for the lapels and produced the two halves with their overlapping seam allowances. The lapel is cut from the beige gaberdine and is interfaced with a fusible canvas for stiffness (see right). The rest of the inside fronts are made from lining and include the pockets. Although I cut the lapels now, they do not get joined at this stage. Setting these pockets is more like the pockets I am used to doing, being a simple welted design, though on this occasion almost entirely made from lining fabric. As I explained in The Time Lord’s Pockets, working in lining can be daunting as it is a very slippery fabric to use, and I want to keep the pockets clean and soft and where possible free from fusible interface stiffening. I also want to make the welts as narrow and delicate as possible, in keeping with their surroundings. The research I did my deconstructing a Marks & Spencer jacket revealed a very easy way to do the pocket, and I am using this technique again here. First I mark a tailor’s chalk line on the top-side of the lining piece (see below, left). Then I set about making the welts I am going to set. This method uses a single piece of fabric for both welts. I need to press two exactly parallel lines along the welts, so to get it as accurate as possible I use a steel ruler as a stencil and fold the fabric around it (see below, centre & right). I am using a piece of calico left over from the test version of the coat as a stiffener for the welt, rather than using an iron-on interface. I have found this give a much better result as it does not stress the lining fabric. Next I pin the welt over the chalk line, and catch another piece of calico underneath the lining panel at the same time. This will give support around the pocket and help prevent distortion as well as stress at the corners (see below, left). I can then sew the welts in place, stitching through all these layers at once. The spacing is critical at this point: I need to sew the welts precisely one quarter the side of the parallel fold, otherwise the welts will not meet if I sew then to narrow; or crash into and overlap each other is I sew them too broad (see below, centre). Just to show things don’t always go to plan, it took me a couple of attempts to get this balance right, but I got there in the end (see above, right). To put and set the lining, I start by assembling the back; made up of the back panels and the side panels. The first thing to do is unite it at the top of the back vent. Extra fabric is included in the pattern for the overlap of the vent, and these are clipped at the top so they can cross in front of each other to create the distinctive dog-leg top the the split. The vertical edges of the lining are sewn to corrosponding edges of the coat tails (see left). The right-hand side, which laps under the left, first needs to be sewn into the lining at its top. It can all get very awkward and confusing at this point, as working space is limited, plus I need to work reasonably quickly and carefully so as not to stress the fabric where it has been clipped. I then pipe the top half of the left-hand side, leaving the uppermost inch loose. The overlap needs to be pinned very carefully into position. Angled too high and the split overlaps too much; too low and it will gape open. This is best done on my tailor’s dummy so I can see exactly how it will hang and adjust accordingly (see right). I can then sew the top of the vent through all layers, except the top-most layer of piping. It’s then a simple (I wish) process of maneuvering the loose end of the piping to form the dog-leg shape at the top. This is then hand-sewn all round into place (see left). Now that the split is sorted, I can sew the inside fronts, with their welted pockets, to the backs, forming the armhole. The neckline is then sewn and some secret internal stitching to keep the lapels in check and folding at just the right point. The last piece of upper body lining is for the sleeves. 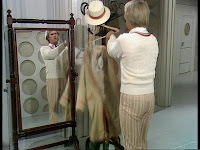 While researching the coat, I noticed in Castrovalva, when The Doctor puts the cost on for the very first time, it is possible to see the sleeve linings (see right - click to enlarge) which are white. It is quite a common thing in suit tailoring to make the sleeve linings a different colour, and white is a preferred choice. I sourced some suitable fabric, and repeated my sleeve pattern for the lining and set them accordingly (see left). That’s a good point to take a little break before tackling the collar and the lapel notch, which can be a little tricky. Check back soon to see how I get on.